Please read instructions fully before attempting game. In yet another attempt to extend the shelf-life of Hostess Twinkies by 3 more years, confectionary scientists accidentally developed a deadly virus which quickly spread across the planet transforming most of the population into zombies. As a lowly technician of the IBC (Interstate Bakeries Corporation), you feel it’s your mission to save the world. Despite what the title suggests, running over zombies is only a secondary priority. Your goal is to rescue 8 confectionary scientists, each of them carrying a component of the experimental vaccine 27B-Stroke-6. The screenshot above reflects actual game play. You are in control of a 1979 Chevy Nova. Your score appears in the upper-left corner. 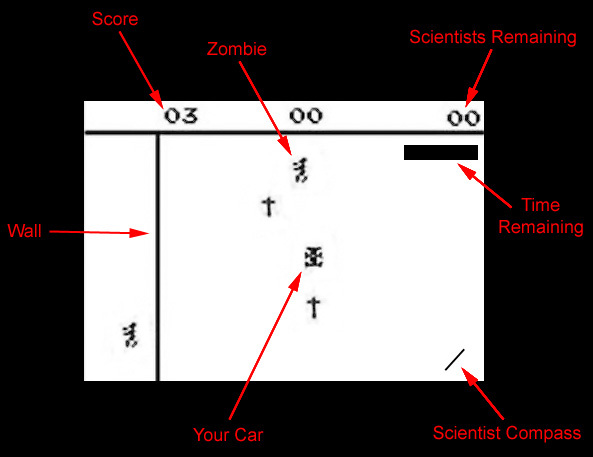 You are free to rack up points by running over zombies. The value in the upper-right corner is the number of scientists that you have yet to pick up. Scientists are colored red to help identify them in a crowd of zombies. Each scientist carries a tracking device. The compass in the lower-right corner points the way to the nearest scientist. Be sure to pay attention to the time remaining bar displayed below the scientists remaining number. It depicts the amount of time you have left to locate the next scientist. You gain time when you make a pick up. However, if the bar fully disappears, your mission will reset (i.e. your score will reset to 0 and the scientists remaining number will return to 8).